Cambridge Eye Care initially opened its doors in 1994 by Dr. Len Brezac. At that time, the practice was called Dr. Brezac & Associates. Dr. Beth Lennox joined the practice as an Associate Doctor in 1997, and then purchased the practice from Dr. Brezac in 1998 when he decided to move back to British Columbia. Dr. Amanda Brown joined Cambridge Eye Care as an Associate Doctor in 2000 after graduating from the School of Optometry. As the practice grew, they relocated from Elgin St. North, to their current location on Conestoga Blvd. 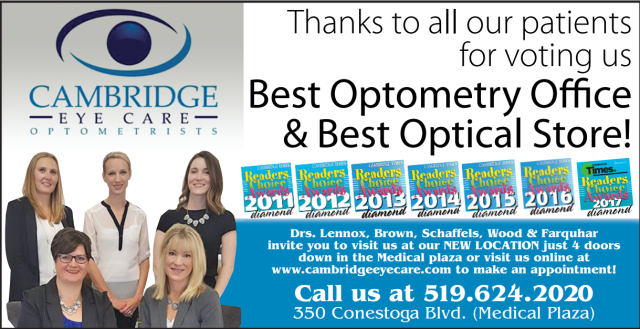 In 2012, Dr. Amanda Brown became a partner at Cambridge Eye Care to assist with the growth of the practice. She and Dr. Lennox have a great partnership & friendship! Dr. Sarah Schaffels (who joined in 2010) and Dr. Kaylee Wood (who joined in 2015) are Associate Doctors who have also been instrumental in the growth of Cambridge Eye Care. Of course, the history of Cambridge Eye Care would not exist without all of our wonderful patients who have been loyal to our practice for the last 20+ years!